I'm not much of a liker of the color pink, but Grace, though only 2 yrs. old has vocalized her like for the color in her toys and in her clothes. So we comply (usually). After having 2 boys and all the cars, sports equipment, bad guy-good guy pretend games.... it's been quite refreshing to see this other side to raising a child. Gracie played with most of her brothers baby toys till she got her first baby doll from Grammy when she had her 1st birthday. Since then we can not go into a store and walk past the toy section without her asking "whersh da baby's?" We usually have to take a baby doll in the car to either pick up the boys from school, driving to our meetings on Sunday, or during bath time (it is safe to assume she sleeps with every. single. doll. she owns). 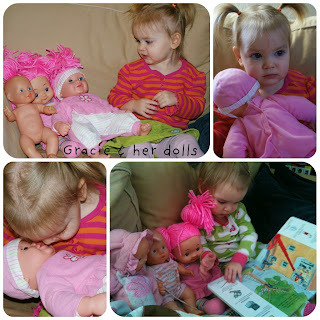 The interesting thing about Gracie & her dolls is that she is not their mommy. If they fall (read: she chunks them across the room and squeals in delight. Yes, sounds terrible but remember she has 2 brothers and they have toys that are supposed to be thrown and she's usually trying to fit in... using her own toys. Feel better about that now?) and get "hurt" she says, "ohhhh nooo... baby fall. Ish okay." and then brings them to me for a "cuddle". Our boys bring us so much joy and laughter....Gracie is no exception. We are blessed and I'm learning to like all this pink stuff.